Designed in 1983 by Maestro bow maker Giovanni Lucchi, the LucchiMeter is an ultrasound tester which measures the acoustic characteristics of wood. 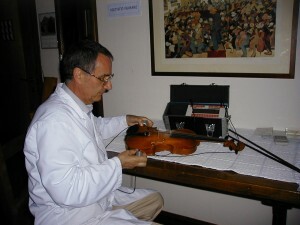 More precisely, it measures the time needed for the sound waves to pass through the material. With this data the elasticity as well as the sound quality can be determined. 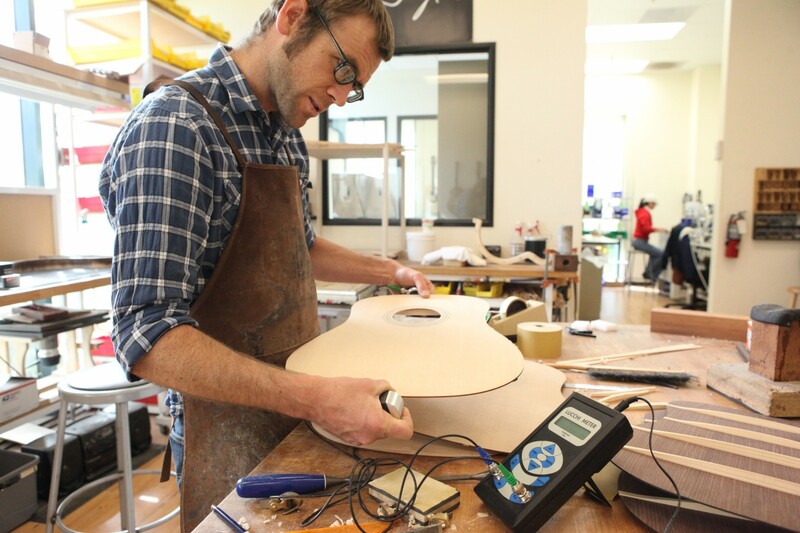 The tester can measure the unworked wood as well as during the working phases and even the finished instruments, whether they be violins, guitars, pianos, oboes, clarinets, harps, reed instruments or bows. 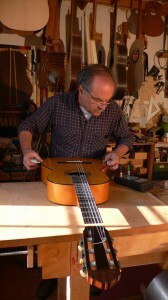 Taking into account the measurements and parameters of the density, we can understand what thicknesses it would be best to respect during the working process, the best varnishes to use and how long their drying time would be, which glues would not compromise the acoustic production of the instrument. 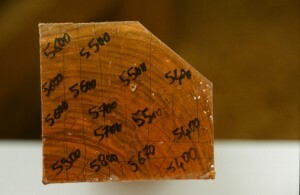 Retailers of acoustic wood were the first to appreciate its use in classifying the quality of their woods, and some of them use the values as a unit of measure for their price lists. 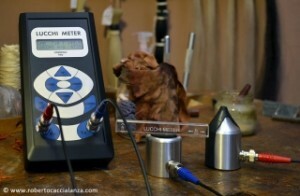 The LucchiMeter is moreover used in the world of artisans, schools of violin making and institutes of acoustic research, as well as by important foundations such as the Taiwanese Chi Mei Foundation. The tool is made up of a generator of impulses that are sent at specific intervals to a rec eiving probe. The two probes, transmitting and receiving, are rested on the two extremities of the material to be measured. The impulses set the wood vibrating and the tester measures the time the wave takes to move from one end to another. Knowing the length of the piece to be tested, one obtains the speed of the sound (Speed=Space/Time). One can measure the longitudinal and horizontal speed, and with relative measures one can evaluate any presence of resin sacs or breaks, because any alteration can be identified as a variation of the time of transit.